Well, we opened our new store yesterday morning at 10am on the 1st of the 10 th month 2010. Great numbers, don't you think? The blossoms are everywhere at the moment and surrounding our new little store. Tulip time has started and the crowds have hit the Southern Highlands for spring. I just can't believe how busy the road is out the front of our store. I have to apologise also for not being around much for the last three and half weeks, there has been so much to do and prepare getting this shop up and running, more than I ever imaged. I really take my hat off to shop owners and all the work they do daily. My gosh, what have I got myself in for. So far it has been fabulous fun. 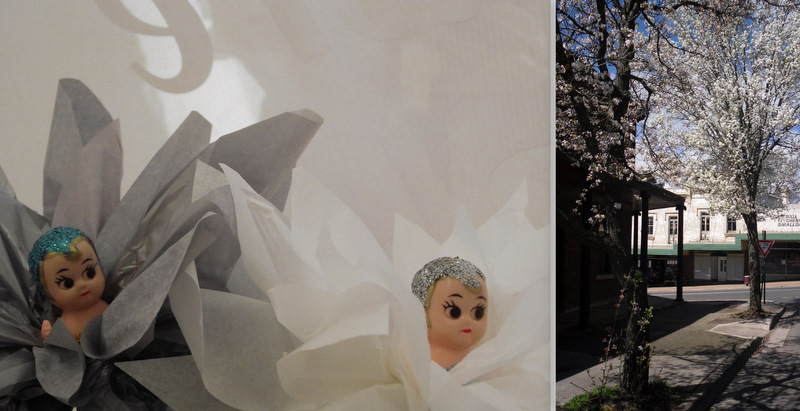 Above: These are the front windows of the shop and a view looking down the street with the blossoms. Bec, my daughter took all these photographs for me as I just haven't had a chance to pick up my camera and thank goodness she did because so much has changed in the last couple of weeks. There is a mixture of many different things in our store, Andrew's furniture, some vintage, my paintings and prints, a showroom, flowers and a show area of both Andrew's and my past work. Upstairs I will have my studio, office and painting room. so please drop in if you're passing and say hi, I would love to meet you. It is 9.30 pm on Friday night and I am happily viewing your blog. decided to email you the comment instead. store in Argyle St. Moss Vale. once small, country town of MossVale. I actually had the pleasure of meeting all of the Farquhar family in their new store. I look forward to many visits, conversations and inspiring learning from a very talented creative. with the Wizard of Oz production. Congratulations! It can't help but be a wonderful success. The location looks idyllic and how clever to open when the trees are in bloom. Beautiful Coty...wishing you so much prosperity enterprising in your new store. May I be so bold so suggest to you Flemish linnen ? from : Het Vlaamsch Linnenhuis ( google it ) ...I would dance into your store if you were the excellent one store in town to sell some of it ...And off course I would be so interested in your collection of furniture.. Your lovely daughter obviously has her won talent as a photographer too ..great job. Goed gedaan ! Oh how I would love to walk through those doors! Coty and family, the store is amazing!!! It all has come together beautifully! What a wonderful way for your friends, neighbors and community to celebrate the arrival of spring and what a wonderful place for them to shop for so many beautiful things. Might you have any jacks? Bec, your photographs are fantastic! Your mum is so proud of you and must adore having your good eye and sense of style at hand. xo to you too. Congratulations Coty, I wish you every success, your store looks quite wonderful - but from you we expected nothing less. It looks marvelous!!! I wish I could come to shop and visit! Best wishes for great success! You are a star Coty - the shop looks gorgeous! The shop looks like a winner! I know you will be very very successful. I only wish I could fly over the oceans and see for myself. Oh I wish I could pop in your beautiful shop and pick up some props! I am a stylist as well, up in the middle of the night making my lists of lists for next weeks shoot. Well I should be making lists....I found your blog for the first time and it is filled with such ethereal images and pure fantasy i am having a hard time pulling away! i love it. I can't wait to spend a few hours 'catching up' when this shoot is over. It is an all Dessert Show so will not be too painful!